Although disposal or reuse occurs after treatment, it must be considered first. Since disposal or reuse are the objectives of wastewater treatment, disposal or reuse options are the basis for treatment decisions. Acceptable impurity concentrations may vary with the type of use or location of disposal. Transportation costs often make acceptable impurity concentrations dependent upon location of disposal, but expensive treatment requirements may encourage selection of a disposal location on the basis of impurity concentrations. Ocean disposal is subject to international treaty requirements. International treaties may also regulate disposal into rivers crossing international borders. Water bodies entirely within the jurisdiction of a single nation may be subject to regulations of multiple local governments. Acceptable impurity concentrations may vary widely among different jurisdictions for disposal of wastewater to evaporation ponds, infiltration basins, or injection wells. Biological processes can be employed in the treatment of wastewater and these processes may include, for example, aerated lagoons, activated sludge or slow sand filters. To be effective, sewage must be conveyed to a treatment plant by appropriate pipes and infrastructure and the process itself must be subject to regulation and controls. Some wastewaters require different and sometimes specialized treatment methods. At the simplest level, treatment of sewage and most wastewaters is carried out through separation of solids from liquids, usually by sedimentation. By progressively converting dissolved material into solids, usually a biological floc, which is then settled out, an effluent stream of increasing purity is produced. Phase separation transfers impurities into a non-aqueous phase. Phase separation may occur at intermediate points in a treatment sequence to remove solids generated during oxidation or polishing. Grease and oil may be recovered for fuel or saponification. Solids often require dewatering of sludge in a wastewater treatment plant. Disposal options for dried solids vary with the type and concentration of impurities removed from water. Production of waste brine, however, may discourage wastewater treatment removing dissolved inorganic solids from water by methods like ion exchange, reverse osmosis, and distillation. Solids like stones, excretes etc. and non-polar Impurties liquid's may be removed from wastewater by gravity when density differences are sufficient to overcome dispersion by turbulence. Gravity separation of solids is the primary treatment of sewage, where the unit process is called "primary settling tanks" or "primary sedimentation tanks". It is also widely used for the treatment of other wastewaters. Solids that are heavier than water will accumulate at the bottom of quiescent settling basins. More complex clarifiers also have skimmers to simultaneously remove floating grease like soap scum and solids like feathers or wood chips. Containers like the API oil-water separator are specifically designed to separate non-polar liquids. Suspended solids and colloidal suspensions of fine solids may, generally following some form of coagulation, be removed by filtration through fine physical barriers distinguished from coarser screens or sieves by the ability to remove particles smaller than the openings through which the water passes. Other types of water filters remove impurities by chemical or biological processes described below. Oxidation reduces the biochemical oxygen demand of wastewater, and may reduce the toxicity of some impurities. Secondary treatment converts organic compounds into carbon dioxide, water, and biosolids. Chemical oxidation is widely used for disinfection. Secondary treatment by biochemical oxidation of dissolved and colloidal organic compounds is widely used in sewage treatment and is applicable to some agricultural and industrial wastewaters. Biological oxidation will preferentially remove organic compounds useful as a food supply for the treatment ecosystem. Concentration of some less digestible compounds may be reduced by co-metabolism. Removal efficiency is limited by the minimum food concentration required to sustain the treatment ecosystem. Polishing refers to treatments made following the above methods. These treatments may also be used independently for some industrial wastewater. Chemical reduction or pH adjustment minimizes chemical reactivity of wastewater following chemical oxidation. Carbon filtering removes remaining contaminants and impurities by chemical absorption onto activated carbon. :1138 Filtration through sand (calcium carbonate) or fabric filters is the most common method used in municipal wastewater treatment. For plant species utilized in water treatment, see Organisms involved in water purification. Wastewater treatment plants may be distinguished by the type of wastewater to be treated, i.e. whether it is sewage, industrial wastewater, agricultural wastewater or leachate. 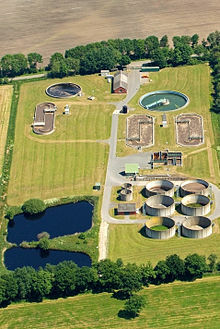 A typical municipal sewage treatment plant in an industrialized country may include primary treatment to remove solid material, secondary treatment to digest dissolved and suspended organic material as well as the nutrients nitrogen and phosphorus, and – sometimes but not always – disinfection to kill pathogenic bacteria. The sewage sludge that is produced in sewage treatment plants undergoes sludge treatment. Larger municipalities often include factories discharging industrial wastewater into the municipal sewer system. The term "sewage treatment plant" is now often replaced with the term "wastewater treatment plant". Sewage can also be treated by processes using "Nature-based solutions". Tertiary treatment is a term applied to polishing methods used following a traditional sewage treatment sequence. Tertiary treatment is being increasingly applied in industrialized countries and most common technologies are micro filtration or synthetic membranes. After membrane filtration, the treated wastewater is nearly indistinguishable from waters of natural origin of drinking quality (without its minerals). Nitrates can be removed from wastewater by natural processes in wetlands but also via microbial denitrification. Ozone wastewater treatment is also growing in popularity, and requires the use of an ozone generator, which decontaminates the water as ozone bubbles percolate through the tank. The latest, and very promising treatment technology is the use aerobic granulation. Disposal of wastewaters from an industrial plant is a difficult and costly problem. Most petroleum refineries, chemical and petrochemical plants:1412 have onsite facilities to treat their wastewaters so that the pollutant concentrations in the treated wastewater comply with the local and/or national regulations regarding disposal of wastewaters into community treatment plants or into rivers, lakes or oceans. Constructed wetlands are being used in an increasing number of cases as they provided high quality and productive on-site treatment. Other industrial processes that produce a lot of waste-waters such as paper and pulp production has created environmental concern, leading to development of processes to recycle water use within plants before they have to be cleaned and disposed. A carbon filtration plant, to remove toxic dissolved organic compounds from wastewater. Agricultural wastewater treatment for continuous confined animal operations like milk and egg production may be performed in plants using mechanized treatment units similar to those described under industrial wastewater; but where land is available for ponds, settling basins and facultative lagoons may have lower operational costs for seasonal use conditions from breeding or harvest cycles. Leachate treatment plants are used to treat leachate from landfills. Treatment options include: biological treatment, mechanical treatment by ultrafiltration, treatment with active carbon filters, electrochemical treatment including electrocoagulation by various proprietary technologies and reverse osmosis membrane filtration using disc tube module technology. The United States Environmental Protection Agency (EPA) and state environmental agencies set wastewater standards under the Clean Water Act. Point sources must obtain surface water discharge permits through the National Pollutant Discharge Elimination System (NPDES). Point sources include industrial facilities, municipal governments (sewage treatment plants and storm sewer systems), other government facilities such as military bases, and some agricultural facilities, such as animal feedlots. Effluent guidelines are regulations for categories of industrial facilities. These standards are incorporated into the permits, which may include additional treatment requirements for individual plants developed on a case-by-case basis. NPDES permits must be renewed every five years. EPA has authorized 47 state agencies to issue and enforce NPDES permits. EPA regional offices issue permits for the rest of the country. Wastewater discharges to groundwater are regulated by the Underground Injection Control Program (UIC) under the Safe Drinking Water Act. UIC permits are issued by 34 state agencies and EPA regional offices. Financial assistance for improvements to sewage treatment facilities is available to state and local governments through the Clean Water State Revolving Fund, a low interest loan program. ^ a b c d e f Metcalf & Eddy, Inc. (2003). Wastewater Engineering: Treatment and Reuse (4th ed.). New York: McGraw-Hill. ISBN 0-07-112250-8. ^ Primer for Municipal Waste water Treatment Systems (Report). Washington, DC: US Environmental Protection Agency. 2004. EPA 832-R-04-001. .
^ "Apex Ecotech Private Limited". ^ Beychok, Milton R. (1967). Aqueous Wastes from Petroleum and Petrochemical Plants (1st ed.). John Wiley & Sons. LCCN 67019834. ^ Byrd, J.F. ; Ehrke, M.D. ; Whitfield, J.I. (April 1984). "New Bleached Kraft Pulp Plant in Georgia: State of the Art Environmental Control". Journal (Water Pollution Control Federation). 56 (4): 378–385. JSTOR 25042250. .
^ United States. Federal Water Pollution Control Act Amendments of 1972. Pub.L. 92–500 Approved October 18, 1972. Amended by the Clean Water Act of 1977, Pub.L. 95–217, December 27, 1977; and the Water Quality Act of 1987, Pub.L. 100–4, February 4, 1987. ^ "National Pollutant Discharge Elimination System". Washington, D.C.: U.S. Environmental Protection Agency (EPA). 2017-01-15. ^ "Industrial Effluent Guidelines". EPA. 2017-05-04. ^ "NPDES Permit Basics". EPA. 2017-01-23. ^ "NPDES State Program Information—State Program Authority". EPA. 2019-03-27. ^ "Protecting Underground Sources of Drinking Water from Underground Injection". EPA. 2019-02-26. ^ "Primary Enforcement Authority for the Underground Injection Control Program". EPA. 2018-12-27. ^ "Clean Water State Revolving Fund". EPA. 2019-03-29. Hammer, Mark J. (1975). Water and Waste-Water Technology. New York: John Wiley & Sons. ISBN 0-471-34726-4. Kemmer, Frank N. (1979). The Nalco Water Handbook. New York: McGraw-Hill Book Company. Patterson, James W. (1980). Wastewater Treatment Technology. Ann Arbor, Michigan: Ann Arbor Science. ISBN 0-250-40086-3. Ramseur, Jonathan L. (September 22, 2017). Wastewater Infrastructure: Overview, Funding, and Legislative Developments (PDF). Washington, DC: Congressional Research Service. Retrieved 17 December 2017. Reed, Sherwood C.; Middlebrooks, E. Joe; Crites, Ronald W. (1988). Natural Systems for Waste Management and Treatment. New York: McGraw-Hill Book Company. ISBN 0-07-051521-2. Weber, Walter J., Jr. (1972). Physicochemical Processes for Water Quality Control. New York: Wiley-Interscience. ISBN 0-471-92435-0.